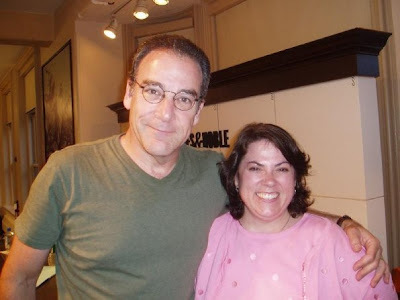 Adventures in the Endless Pursuit of Entertainment: Tonight: Mandy Patinkin at the Public Theatre! Tonight: Mandy Patinkin at the Public Theatre! Tonight: We'll be at the Public with Mandy Patinkin as he presents his concert Celebrating Sondheim! I can't wait to hear him sing Anyone Can Whistle and Take me the World, but most of all I'll welcome anything from Sunday in the Park with George. What happened to his beard??? At least he's recognizable again! You know all the cool people!!! I can't stand it! You always manage to not only have your picture taken with these handsome hunks, they always are giving you a manly hug like the hot ticket that you are.